How did Zombie Fest begin? The 1st annual Zombie Fest was held October 13th, 2012, and included FREE pumpkins for children, a kids’ Halloween parade, a fundraising Zombie Zumbathon, and a spectacular performance of Michael Jackson’s Thriller Dance by the Seattle Thrillers. Rain and gray clouds did not stop 300 people, primarily families and some dressed as zombies, from attending this unique, new festival. THANK YOU to the City of Normandy Park Economic Development Committee for organizing this free public event! From that moment on, Zombie Fest took on a life of its own! Photo courtesy of Joshua Lewis, KOMO. View the rest of his photos on the KOMO website. Normandy Park Zombie Fest now draws nearly 2,500 people from King, Pierce, Snohomish and Thurston counties. The annual festival raises awareness about emergency and disaster awareness, and partners with emergency agencies, civic groups and utilities including Normandy Park police and fire, Republic Services, King County Library Services, Puget Sound Energy, Highline Schools Foundation and Friends of Normandy Park Foundation (501c3). Dozens of generous local businesses, organizations and individuals also support this festival and provide FREE items for children to collect for disaster preparedness kits. Zombie Fest also features live music, food, beverages, commemorative t-shirts, raffle baskets, business booths, a mock disaster vehicle display, arts & crafts for kids, and a Zombification Booth! People line-up and enter the 20/20 tent, and then THANKS to our amazing make-up artists and “zombified” clothing donated by Value Village, festival-goers exit the tent as zombies! You’ll have to see it to believe it! 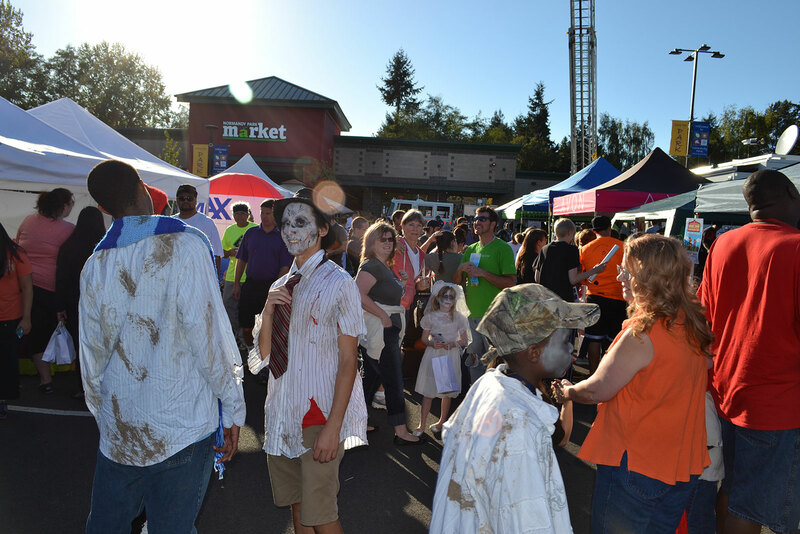 At Zombie Fest, we also raise money for the Highline Schools Foundation Excel Grant program, Highline Food Bank, Des Moines Food Bank and Friends of Normandy Park Foundation (501c3). Join us at Zombie Fest! Learn about disaster preparedness, raise money for local charities, and see the generosity of Normandy Park and our surrounding communites! Join us at Zombie Fest Northwest and you can be one of the lucky few to receive this commemorative ZFNW5 button.